Not only does this book have a fearsome cover, the message it disseminates is equally chilling. 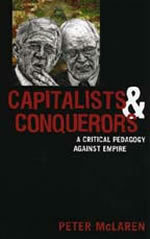 Peter McLaren has authored this book at a time when it seems that the disease of capitalism is spreading and it is legitimised by the ideological apparatus of neo-liberalism. McLaren not only unpacks the language of the status quo, and explains the complexities of its matrix, but he tears apart its propaganda. The book is a collection of essays all authored by McLaren in collaboration with distinctive authors including Valerie Scatamburlo-D'Annibale, Paula Allman and Glenn Rikowski, Donna Houston, Gregory Martin, and Nathalie E. Jaramillo. The essays are written eloquently and in a manner that is accessible to academics and students alike. The reasoned arguments are substantiated with wonderful examples of the subterfuge and the plain evil of the Bush II administration vis-à-vis its war on justice, liberty and emancipation. The book's greatest asset is the way that it untangles the web of lies and untruths manifested and perpetuated through education systems, the media, religion, IMF, WTO, World Bank and other globalised structures. As well as producing a formidable argument against neo-liberalism and capitalism, McLaren brilliantly examines the relationship between class, gender, race and ecology with capital. The book not only deals conclusively with the criticism aimed at Marxism, and the limitations of postmodernism theory, but also persuasively offers dissent through critical pedagogy and revolutionary pedagogy. The overarching argument in all the essays is that the time is ripe for a sustained and concerted effort, especially in schools, to resist and challenge the status quo. The reader will conclude that the alternative is a socialist future underpinned by peace and justice - but this needs action, and now. It is absolutely delightful to see a heavyweight of McLaren's calibre come out with all guns blazing alongside his collaborators. This is a hard-hitting book that clarifies the state of the world, and what we could do about it. McLaren, for more than two decades, has consistently produced works of immense quality. This has to be among the best.